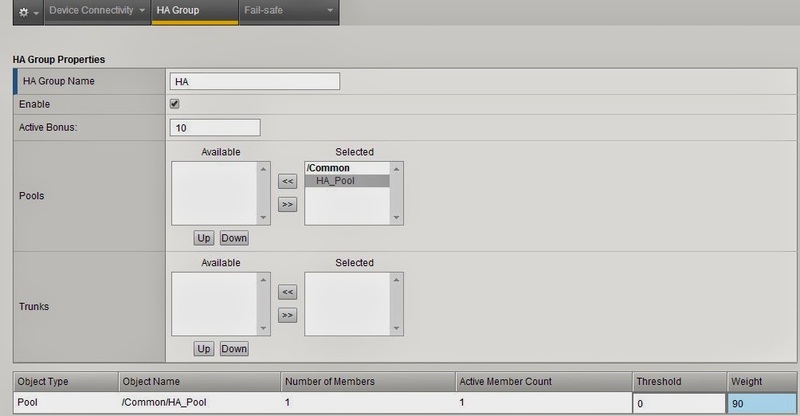 Configuring access switches in an enterprise may involve deploying a bunch of identical settings to a load of devices, this kind of work is time consuming and not to say BORING AS HELL! In case you are working with Cisco or Juniper as the vendor of the devices there is a way of deploying the configuration automatically by using a DHCP+TFTP server. All you need is to use all you need is to is to configure the pool with option 150 pointing to the TFTP server and put a config file on the TFTP root folder. I suggest including "no service config" in the base configuration file, otherwise as the configuration is loaded the device will try to load a new file with its' new host-name every time it renews the DHCP lease. Now let's move to another vendor – Juniper, in this case it's a bit more complicated as we need a couple more DHCP options. In Juniper's case the process is very similar, with the difference that the switch includes a software upgrade as part of the process so we need more free space on the tftp server, for this example I used Red Hat Linux for both the DHCP and the TFTP, here is the configuration the DHCP side, first of all DHCPD has to be ISC 4 and above. Under "# Define Custom Options"
*Note the type of option 150 is IP. host-name option will change the hostname of the switch, note that the switch will only load the configuration file with the name of its hostname. Image type is the Vendor requirement. The transfer more can be http/ftp/tftp/sftp but must be defined. option JUNIPER.alt-image-file-name "/<NEW JUNOS VERSION FOR THE SWITCH TO LOAD ON THE ALTERNATE SLICE, RECOMMENDED TO BE IDENTICAL>"
Define the range of IP's for the DHCP server. In FTP transfer mode request will be made via anonymous user. Big thanks to Omer Shtivi for the resources and help with implementation. When a device is activated with license that include App Mode the root user and all access to the BASH is being blocked. 01070356:3: Root Account feature not licensed. To better secure the device it is recomended to keep it in this mode. 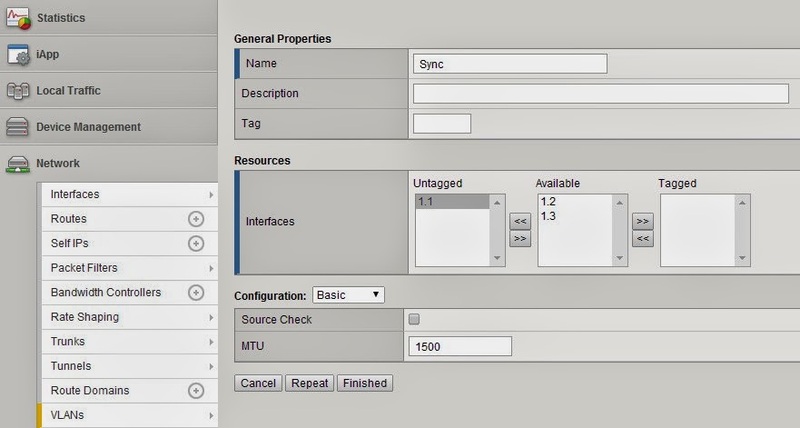 Here is a nice feature you can use on a Cisco device to make the usage easier in case of a console server or just for limiting access for an experienced user - We can create a menu with pre-configured commands \ actions. First we configured the prompt for the command selection, then the text for "1,s,e,q' then the commands that will be issued according to the selection. At this point the menu can be activated by running "menu Menu-1" from the command line. 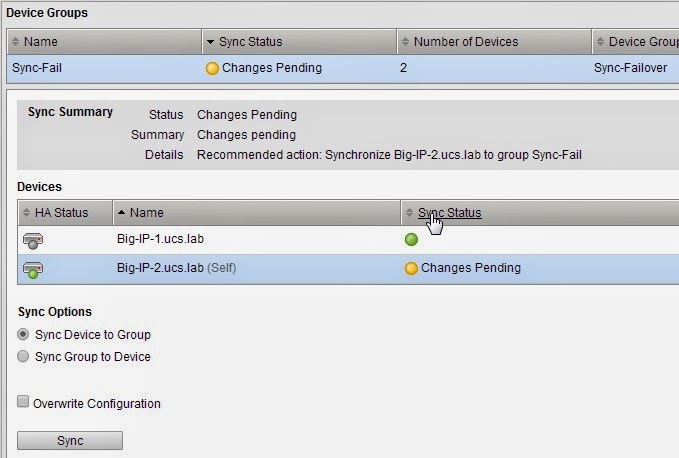 Here is a sort of "Best practices guide" for a Cluster configuration on F5's Big-IP devices, I will refer to the configuration of two devices but same applyed to a larger cluster. CLI - tmsh list /sys ntp servers or ntpq -npdate or date -s "Day Month Year HH:mm:ss"
An important note here is the "Port Lockdown" - make not to use "allow none" as it will not allow sync traffic between the devices. other than that - only the IP\Subnet configuration. **It is highly recommended to use a "real" network Vlan for the failover interface this way a problem with the Vlan which is actually used for traffic will cause a faileover. 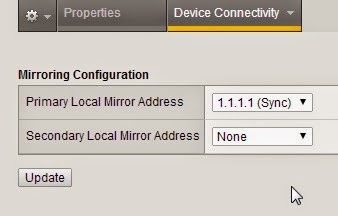 I like to resetting the device trust prior configuring the cluster so that any leftovers of privious config will be cleared and the local certificate will be regenerated. At this point we are done with the preparations. 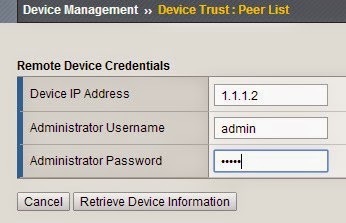 I Like using the P2P IP's but it's an identifier only so Management IP are good as well. After clicking "Retrieve Device Information" we should get the 2nd device's certificate, IP and couple more details. 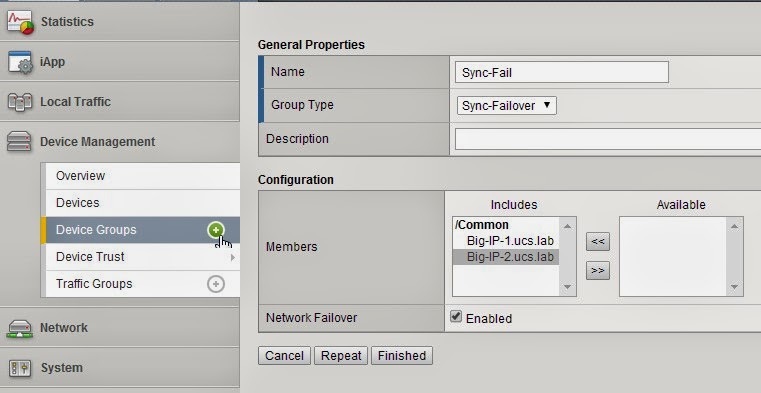 The Type should be Sync-Failover and both devices are selected. 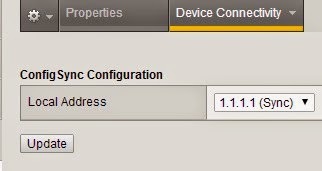 Select the device containing the newest configuration, select "Sync Device to Group" and click "Sync"
I like to create a more proactive configuration by adding a pool which consists of a couple of servers as the representation of the LAN and the ISP \ FW as the representation of the WAN, so as long as this pool is active we have both LAN and WAN connectivity from the device and if the pool fails F5 lost WAN\LAN access so we need to failover. in other words let's say we have a Data Center with 50 Web servers, we want to make the data more secure by implementing SSL encryption on our HTTP data, at this point we can configure each server to work with https OR we can add a device that adds the SSL on an outgoing packet and removes it from the once coming back, that way our traffic is secured and we save on server resources. before getting to the configuration part i want to spend a moment on the CA-Bundle or also known as intermediate Certificates .. There are some CA's out there that in order to use them we have to append an Intermediate certificate to the Certificate we have, the intermediate is sort of a reference of our CA pointing it to the root that will verify it, in other words it's the certificate of the CA that authorized our certificate. for example some browsers will not have the root of Go-daddy even though they're CA is well known and authorized so in case a website using one of there certificates (but no intermediate is installed) will be accessed by and old browser it will show the certificate is not verified and we'll have an error message accessing. Using the intermediate in the F5 is very simple, all we need to do is import it to the device and append it in the client profile as "Chain Certificate"
Just need to make sure we choose an HTTP profile and the SSL profile we have configured earlier. other than that we're all done. I would like to share a case I had involving MacSec over a layer 3 link. The equipment was: 2 Cisco Switches (3750X), Cisco 2821 Router, Juniper J4350 Router. Objective: establish MacSec between the Switches. First of all MacSec will not work on layer 3, to make it work we need to emulate layer 1 between the switches, I did this VIA MPLS (Ethernet over MPLS). In case the VC is not up try to change the circuit number..